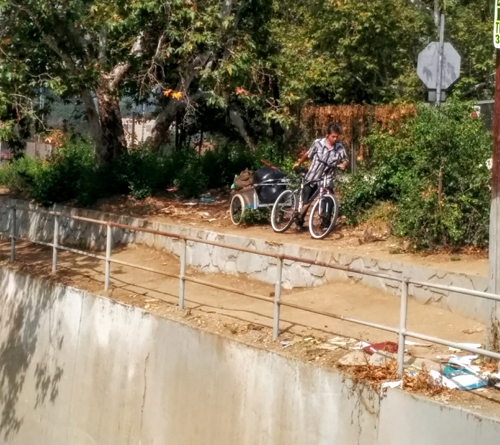 Struggling to push the bicycle loaded with his belongings along the bumpy path carved out of the brush next to the Arroyo Seco channel in Highland Park last week, a homeless man grumbled he was being forced to leave the encampment that was his home. “I don’t know what I’m going to do! I don’t know where I’m going to go,” he said as he pushed his bike through a hole cut in the wire-mesh fencing next to the Avenue 57 exit on the Arroyo Seco Parkway-110 Pasadena Freeway. He was one of more than two-dozen homeless people removed from illegal encampments located between Avenues 52 and 57; invisible to many of the drivers on the freeway. But to residents living nearby, the network of knotted tarps, tents, clothes hanging from the bushes and fencing and growing piles of trash are not only an eyesore, they’re a public safety issue. They demanded that the city clean up the area and move the homeless out. In response, on May 25, as required by law, the city posted signs notifying encampment dwellers that they had three days to leave and remove their belongings before the city starts clearing the area on May 28. The city’s departments of public works, parks and recreation, officers from the Hollenbeck and Northeast police divisions and the of Councilman Gil Cedillo (CD1), coordinated the cleanup. County mental health workers and employees with the Los Angeles Homeless Services Authority (LAHSA) were also called in to assist anyone wanting help: there were no takers. 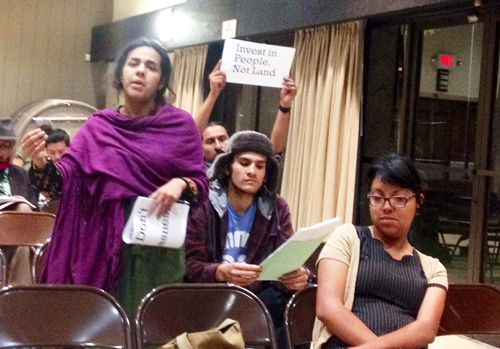 “CD1 takes these complaints seriously,” Cedillo told EGP in an email. “The intent was not only to ensure the safety and livability for the surrounding community, but to also offer homeless services to the individuals living in the encampments and to get them connected with valuable social services,” he said. About 30 people were living in the 17 encampments along the Arroyo, according to public works spokesman Jimmy Tokeshi. He said it took a day and a half to clear the 18 tons of trash and debris removed from the third-of-a-mile stretch along the freeway. How to best deal with Los Angeles’ homeless population has sparked increased debate in recent months, from calls for more police enforcement to building more affordable housing. Residents watching the cleanup such as Wendy Riser, said they’ve heard that some of the homeless in those encampments at some point were residents of Highland Park, but ended up on the streets because of different situations such as loosing their jobs, increase of rent, mental illness or drugs. Several homeless in Northeast L.A. neighborhoods like Highland Park, Montecito Heights, Eagle Rock and Cypress Park have ties to the community, including family and friends who live nearby. That was the case last week when a young woman, seeing the clearing underway, ran to the encampment in search of her mother who she told police had been living there with a boyfriend. She wanted to know if her mother was ok, explained LAPD Officer Oscar Cassini. It’s not uncommon for relatives to know that a loved one is living at one of the homeless encampments, to keep track of them there, he said. Some people might find that shocking, but there are lots of reasons why someone can’t take in the homeless person, Cassini said, referring to cases of mental illness or heavy drug use. The number of people in Los Angeles living in “tents, makeshift shelters, and vehicles increased by 85% from 2013” when the number was 5,335,to 9,535 today, according to the recently released results of LAHSA’s 2015 Homeless Countdown. Skyrocketing housing costs are a big part of the problem, claim affordable housing advocates. According to LAHSA’s report, California’s lowest-income households spend about two-thirds of their income on housing. The 2014 USC Casden Forecast reported that as of December 2014, the average monthly rent in the Los Angeles region was $1,716, making L.A. one of the top 10 most expensive places to rent in the U.S.
Outreach staff sent to last week’s encampment clearing spoke with 18 men and 7 women but were unable to get them to accept services, LAHSA Spokesperson Eileen Bryson told EGP by email. “Most of the encamped homeless dwellers were preoccupied with managing their personal items during the clean up,” she said. “Some of them do drugs and in the shelters you can’t do that,” he said, moments after taking one of the homeless men into custody on an outstanding warrant. Bryson said crews removed a large number of illegal and dangerous items such as 117 hypodermic needles, 50 aerosol cans and 17 propane tanks. Animal Control Services remove three chickens and a cat, she said. Caltrans had to disconnect power lines illegally connected to light poles along the 110 Freeway, providing electricity to 6 of the encampments, Bryson said. A passerby walking his dog found the removal activity troubling. Moving the homeless will not solve the problem, it’s “just a band aid,” said Christopher. There must be a better solution. Cleanup of other encampments between Via Marisol and Bridewell Street along the Arroyo Seco channel started this week should be finished today, according to Tokeshi. Crews will remove “trash and bulky items, and when appropriate store property found in the cleanup area within the framework of the court decisions aimed at protecting individual rights,” he said. The 2015 Homeless Count report from LAHSA found that there are 25,686 people in the City of Los Angeles with no homes. In CD1 there are nearly 2,000. The Los Angeles City Council agreed Wednesday to begin creating a citywide approach to cleaning up trash and picking up couches, televisions and other bulky items illegally abandoned on streets. City officials spent the past six months studying the issue, which included examining how other major cities such as San Francisco, New York City and Washington, D.C., handle abandoned waste. City officials presented a proposal to the City Council that calls for a more proactive approach to tackling illegal dumping and trash-strewn streets, including deploying a team to scout for trash to pick-up and using data to target “hotspots” of abandoned trash. The Public Works Commission would also have a greater role in managing the proposed trash pick-up and street clean-up program. The proposal also calls for adding more trash cans to the streets. There are currently about 1,000 trash receptacles around the city, officials said. The approach differs from the city’s current reliance on a complaint-based system in which residents are expected to dial 311 to report bulky items discarded on the streets. The strategy has fallen short, with some Angelenos not even aware of the existence of a telephone hotline for making complaints, officials said. City Administrative Office Miguel Santana said it could take several more weeks to develop a plan for carrying out the new strategy. The costs have not been determined, but the hope is to find special funds and sources other than just the general fund, Santana said. The latest strategy for tackling abandoned trash builds on efforts in City Councilman Gil Cedillo’s northeast Los Angeles district that he says has led to more than 2,500 tons of trash being cleaned up during the last 18 months. Trash was cleared out of 286 alleys, and at least three dozen clean-up events were organized throughout his district, Cedillo said. “This problem is one of the most vexing problems that we have in the city,” said Cedillo, who decided to make trash clean-up a priority after seeing refuse and abandoned bulky items cluttering up the district’s streets while he campaigned for a seat on City Council. “It’s so important for us to have a clean city,” he said. “This large urban area … we’re more dense (than many other cities) and as a result we have more trash. What we don’t have is the infrastructure” that other cities have for tackling abandoned trash pickup. The council also approved a motion by Cedillo and fellow council members, Joe Buscaino and Mike Bonin, that orders staff to produce reports on adding more trash cans, regulating illegal dumping, creating a public awareness campaign and targeting “chronic illegal dumping” in South Los Angeles, Watts and the Harbor area. Mayor Eric Garcetti allocated $5 million this year toward cleaning up trash, after several years in which abandoned trash pick-up programs had been scaled back. The city lost about 250 sanitation employees in recent years, and the cost of cleaning up abandoned trash has traditionally cost about $12 million, according to Sanitation Bureau Executive Director Enrique Zaldivar.